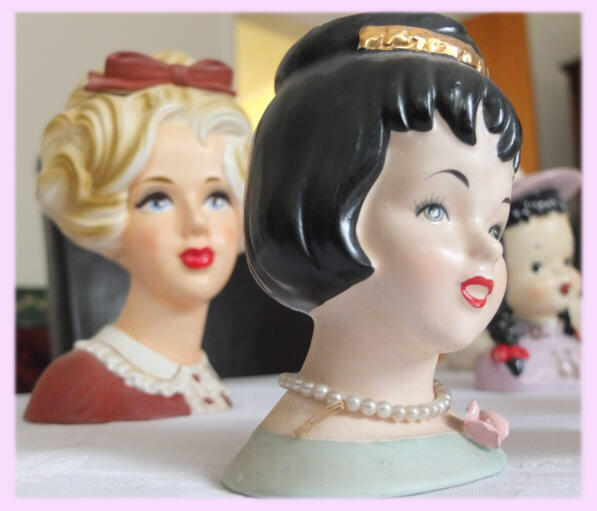 Oh, for the Love of….Lady Head Vases! | Oh, for the Love of Vintage! 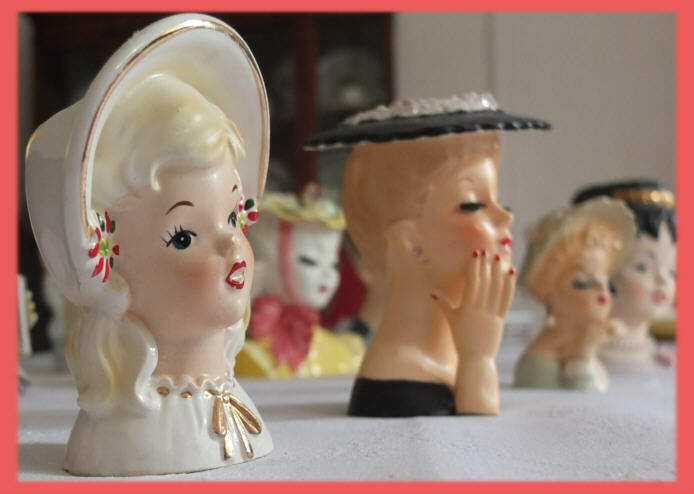 Today’s post is about an item I collect and adore, lady head vases. I started collecting these years ago and my mother often adds ladies to the growing collection. I love lady head vases because they’re beautiful, fashionable, glamourous and also have a practical use. What is a Lady Head Vase? A lady head vase is just as the term describes: a ceramic floral vase shaped into the head of a lady. Lady head vases were introduced in the 1940s and were very popular up to the 1970s. These vases depict glamourous ladies with stylish hats, pearl necklaces, earrings, brooches and lush lashes. In the 1960s, teen age girl head vases were introduced. Celebrity head vases were also created in the likeness of Lucille Ball, Jackie Kennedy Onassis and others. To me, lady head vases often appear to have a haughty look and I love them for it! The lady head vases in my collection span from the 1940s to 60s. I particularly love models from the 40s and 50s and am always on the lookout for a new lady. I would love to find a rare Lucille Ball lady head vase for my mom. I’m keeping my eye out for that! Collecting lady head vases is a lot of fun. You never know what kind of a lady you’re going to come across at a flea market or yard sale. It’s always a thrill! Lady head vases are highly collectible and because of that the prices keep going up. Prices for lady head vases range from $20 to in the thousands depending on the piece itself, its condition and rarity. The celebrity head vases mentioned previously usually fetch a higher price. If you’re looking to start a lady head vase collection you can often find them at yard sales, flea markets, thrift stores and antique shops. I would be wary of purchasing them online as there are a lot of reproductions in the market. Companies are producing vintage looking lady head vases and passing them off as originals from the 40s, 50s and 60s. Beware! Several companies produced lady head vases in the 40s to 70s. Here are some company names that can help you identify your vase: US manufacturers – Betty Lou Nichols and Henry Holt and Japan manufacturers – Napco, Inarco, Lefton, Enesco, Relpo and Reubens. I always wondered about these when I ran across them at an antique fair! Good post! I love Lady Head vases but unfortunatley we don’t really get them in England and the ones on eBay are a bit too expensive for me at the moment. Maybe one day I’ll get to buy one. Hi Andre…how are you planning to sell the head vases ? PLEASE CONTACT ME…i am a new collector and would love to buy them!! midcenturyfella, I bet you’ve seen a lot of great ones! Natashadevil, I didn’t realize that they weren’t a popular trend back in the 40s, 50s, 60s in England. I guess it was mostly a US/Canada fad. I’ll keep my eye out for one, for you! Expensive…and, dare I say, homely. You’d think the Lucille Ball lady head vase would be lovely! Disappointed. 😦 Thanks for sharing hun! Pingback: Vintage Runs in the Family « Oh, for the Love of Vintage! A lady auctioneer will be selling 400+ vintage lady head vases from the collection that I inherited from my Aunt. I also have 70 at my home of higher value if anyone is interested. I can email the site for the auctioneer as well as email you pictures of the ones that I have. We have approximately 800 total. I forwarded your email to about 20 collectors that I have connected with since inheriting my Aunt’s Lady Heads. I asked each one of them to forward the info. to all of their collector friends. We pray that you have a great response from collectors on Saturday. We have to go to a wedding in Lake Charles that begins at 6 p.m. Our thoughts will be with you all as you work hard to sell our Lady Heads. Pearl necklace are really very elegant and i really love them. .. I have a rare head vase for sale at this link. I’ve been trying to sell it for a long time and haven’t had any luck yet! Love your blog. I have a few vases myself and a lens – hope you will visit. tried to add my lens – will try again. i have my grandmothers lady vase head. it is in perfect condition with the original flowers. K10098 Relpo. Can someone tell me when this was made, value, etc.. I have a Lucille Ball head vase that i would be willing to sell. Please contact me through FACEBOOK. Nicole Cardwell from Royal Oak, MI. Thank you. Do you have any idea where I could get an appraisal for one? John – I have a question about heads that might have been repainted… Can you help with that? My email is lolee5353@aol.com Thank you! Hello. I recently acquired a vintage Head Vase and was doing research on it and I ran across this article. While I realize this article is four or five years old, hopefully Black Dahlia will see this. 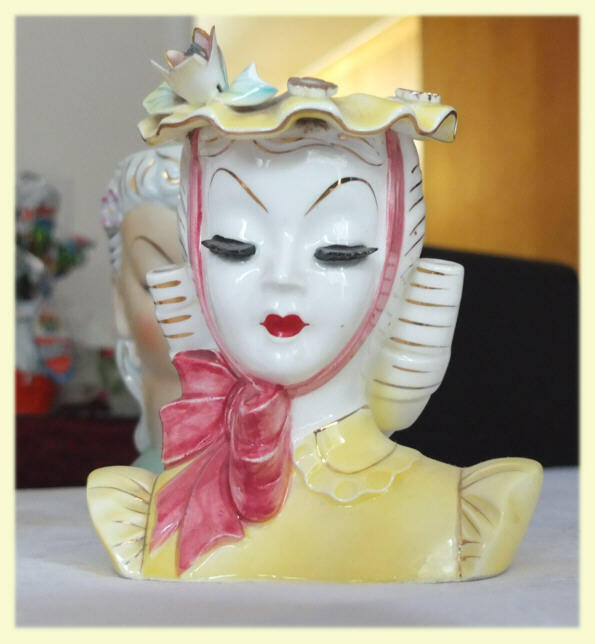 The Head Vase that I have is what I believe to be a Lucille Ball as Mame Head Vase. It is marked Rubens 531 on the bottom. I would love to learn more about it. Send me an email, and I could send you some pictures. The hat is an aqua blue with a red band. It has a few small scratches on the back of the hat, both otherwise is in great condition, to my untrained eye. What does a rare Lucille Ball head vase look like? When it comes to “Lucy” lady headvases, two (2) examples come to mind. Obviously, size & condition are critical when it comes to valuation…..might you have a photo and/or description ?……John (email is ncodmus@aol.com)….